This issue was experienced by a client using the Australian installed edition of Evolution. 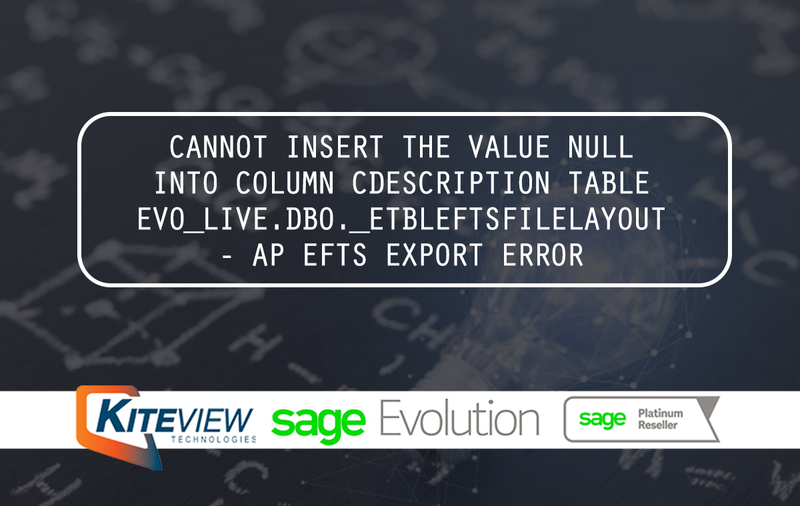 They properly installed the Australian edition of Evolution but were getting the above error on EFTS Exports. 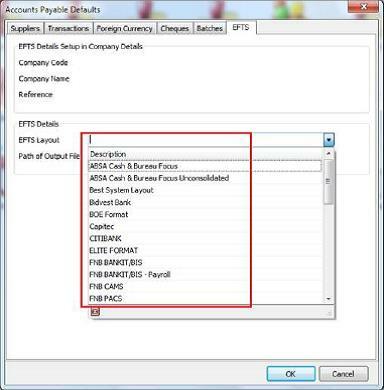 The client discovered that the Accounts Payable | Maintenance | Defaults | EFTS screen only presented the South African EFT bank list (as also found on the Common | Maintenance |EFTS File Layout grid). Close Evolution on the local PC. Open the local Evolution installation folder (e.g. C:\Program Files (x86)\Sage Evolution). Open the Evolution.ini file (use Notepad if it needs an application to open it). Change the cCode value from 0 to 1 and save the changes on the Evolution.ini file. When logging back into the company, the original Australian EFTS bank layouts should be back. After selecting the relevant Australian EFTS layout, the EFTS Export run should be completed without further issues. Note that if using the South African edition of Evolution results in the above error, ensure the value in step 4 above = 0. For using the New Zealand edition of Evolution the value = 2. Repeat the same steps on all the workstations from where EFTS export runs need to be executed. Disclaimer: These articles refer to possible solutions and a platform to share information. Each article describes a method that solved a query (knowledge gathered from previous sites) and how Sage Evolution should operate. These articles make reference to a specific Sage Evolution version, however the thought process can be generalised. Please note the information contained in these articles should be treated as guidelines and adapted to accommodate differences in business processes and IT environments. Articles may not be applicable to all environments. If this article did not resolve your query please contact Kiteview Technologies Support Department on: (+27) 010 005 6678. Kiteview Technologies (Pty) Ltd was founded in May 2010 to provide the Sage Evolution Business Management solution to the SME market. The management team of Kiteview have combined +30 years of experience in the delivery of small to mid-market Financial & Business Management solutions. 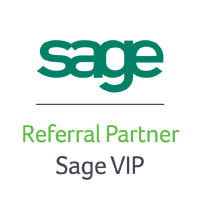 This experience, combined with a sound project implementation methodology has helped in Kiteview’s growth, becoming a Platinum status partner for SAGE Pastel within just 1 year. Get In Touch. Fill in the form below and we will contact you as soon as possible. Kiteview Technologies (Pty) Ltd was founded in May 2010 to provide the Sage Evolution Business Management solution to the SME market.